I am currently 29 weeks pregnant with baby number two and cannot wait to meet this baby! I have focused on my nutrition during this pregnancy because it not only makes me feel better but also helps to grow a healthy baby. I have been lucky not to have food aversions so I have been able to eat anything (trust me, I have been eating everything!) and have focused on nutrient dense foods that will help baby (plus some treats too of course!). 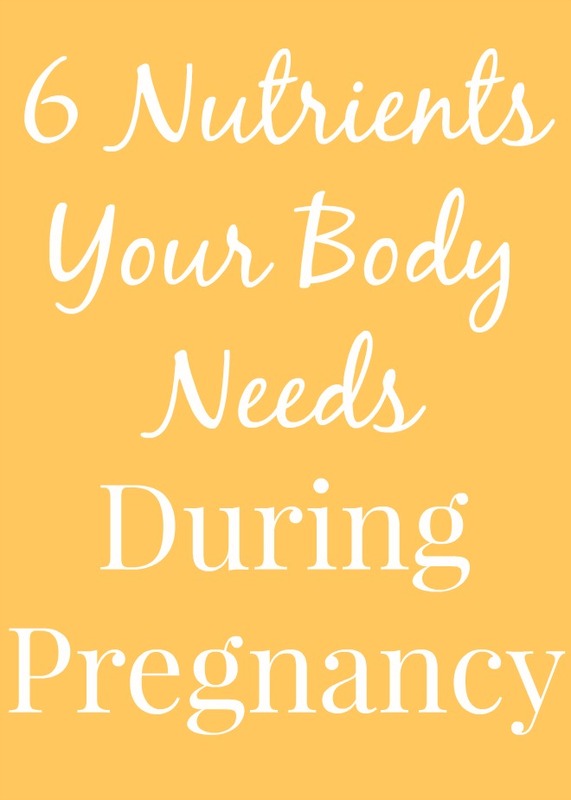 These are 6 of the super important nutrients that your body needs during pregnancy to grow a healthy baby! Choline is an important nutrient for pregnancy for many reasons. It helps with memory and aids in heart health- homocysteine can increase your risk for heart disease and choline can help to reduce these levels. 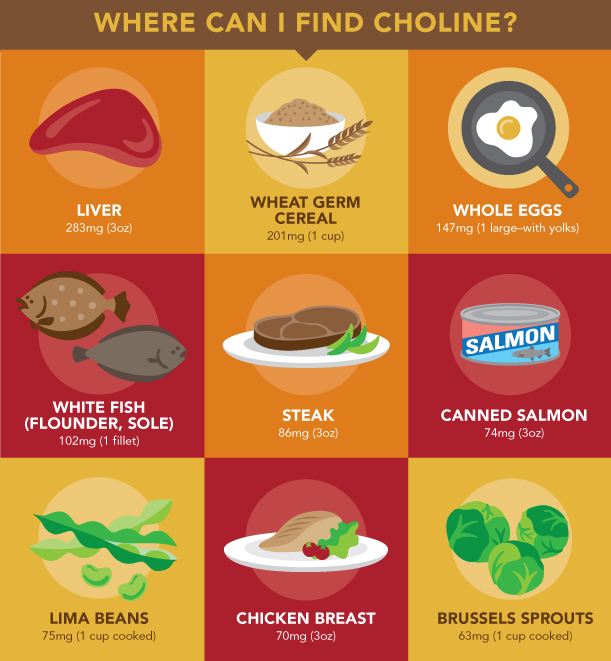 Choline is important for metabolism and helps the liver run properly by moving fat out and helping to convert the food you ate into energy. Also, choline helps to give you energy for physical activity by sending a message from your brain to your muscles to move. Choline is essential during pregnancy because it is passed from mom to baby to help prevent neural tube defects and can help improve your child's ability to focus better and process information later in life. Choline works together with B vitamins to help give a mom-to-be more energy- something that all of us pregnant women can benefit from. 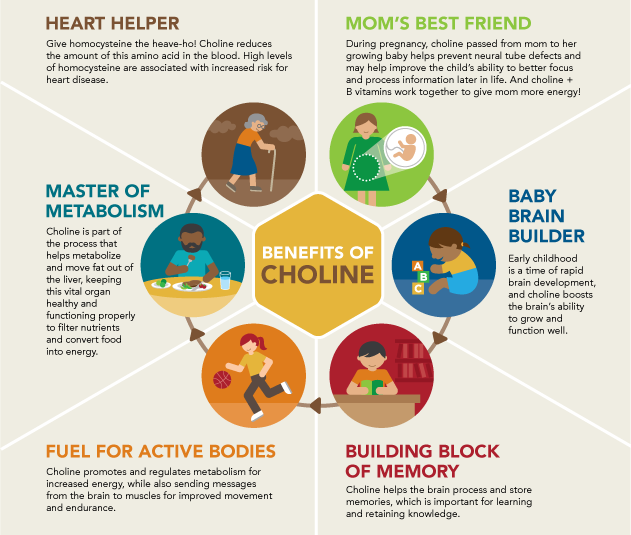 Once baby is born, choline boosts the brains ability to grow and function well. Anything to help brain development is so important! Later in life, choline is important to help prevent cognitive decline. This is something else close to my heart as I work in long-term care with primarily elderly patients. We serve a lot of eggs, fish and chicken to help meet their choline needs. Something that I think is crazy is that with both of my pregnancies, I have craved eggs so badly in my first trimester. This time, nothing sounded good for breakfast except for eggs so my husband made me egg sandwiches to take to work every single day for a week. One night when I was about 16 weeks or so, we were watching a show and I could not get scrambled eggs out of mind. My husband paused the show and made me some- it was very sweet and it hit the spot. I don't know if my body was specifically craving choline (and maybe the protein) but I had the strongest cravings for eggs early in both of my pregnancies. 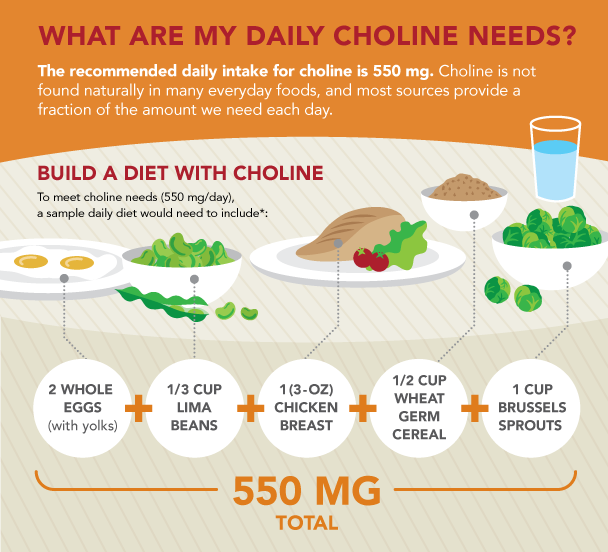 How much choline do I need a day and how do I get it? Eating a diet that is rich in lean meats, whole eggs and green vegetables can help you to meet your choline needs for the day. Check out these choline rich recipes: Loaded Chilaquiles, Healthier Chicken Marsala, Brown Sugar Pecan French Toast Casserole, Mexican Breakfast Casserole, Orange Glazed Brussels Sprouts and Sweet Potatoes. Omega-3 is found in many kinds of fish and is important for your baby's brain development. Aim for 8-12 ounces of fish per week during your pregnancy. Low-mercury choices that are safe for pregnant women include shrimp, salmon, pollock and catfish. Try my Grilled Salmon Chopped Greek Salad. I am not great about eating fish to be honest so I get my omega-3 fatty acids from flax and chia seeds mainly along with an omega-3 supplement daily. Try my Healthy Pregnancy Smoothie which contains chia seeds for protein, fiber and omega-3s. Iron deficiency can be common during pregnancy and many women have their iron levels tested when they are pregnant to make sure that they are not low. Over 17% of women are diagnosed with iron deficiency during pregnancy. During pregnancy, aim for 30 mg of iron per day. Iron rich foods include meat and seafood, beans, dried fruit, peanuts, greens, broccoli, Brussels sprouts, sweet potatoes and more. Try my iron-loaded Lemon Chicken Piccata or Kale Salad with Lemon Yogurt Dressing. Pregnant women have an increased need for folic acid during pregnancy since it helps prevent neural tube defects in babies. Aim for 400-800 micrograms per day. Foods rich in folate are: green leafy vegetables, beans, citrus, whole grains and other enriched foods. Your prenatal vitamin will have folic acid in it as well. Try my Christmas Salad which is delicious year round or Roasted Beets and Oranges with Baked Tilapia. The recommended amount of protein to consume during pregnancy is 75-100 grams per day. Protein rich foods help the growth of fetal tissue including the brain, increases blood supply and helps breast and uterine tissue grow. Focus on nutrient rich protein sources such as Greek yogurt, milk, lean meat, beans and nuts. Try my Spinach Artichoke Chicken, Cranberry Greek Yogurt Parfaits or Healthier Chicken Salad for protein rich meals. Your developing baby needs calcium to build strong bones and teeth along with a healthy heart, nerves and muscles. When a mom-to-be does not consume enough calcium during pregnancy, the baby will draw calcium from mom's bones which can affect a woman later in life. Therefore, it is very important to get enough calcium during pregnancy. The recommended amount is 1000 mg per day. You can get calcium from dairy products as well as greens and fortified orange juice. Try my Banana Split Overnight Oats, Yogurt Parfait Popsicles or Carrot Cake Smoothie. Disclosure: This post was sponsored by VitaCholine. As always, all opinions are my own.